I only had broken links to the pictures but I'm hearing that Blogger was completely broken around most of the internets yesterday and wouldn't even load. 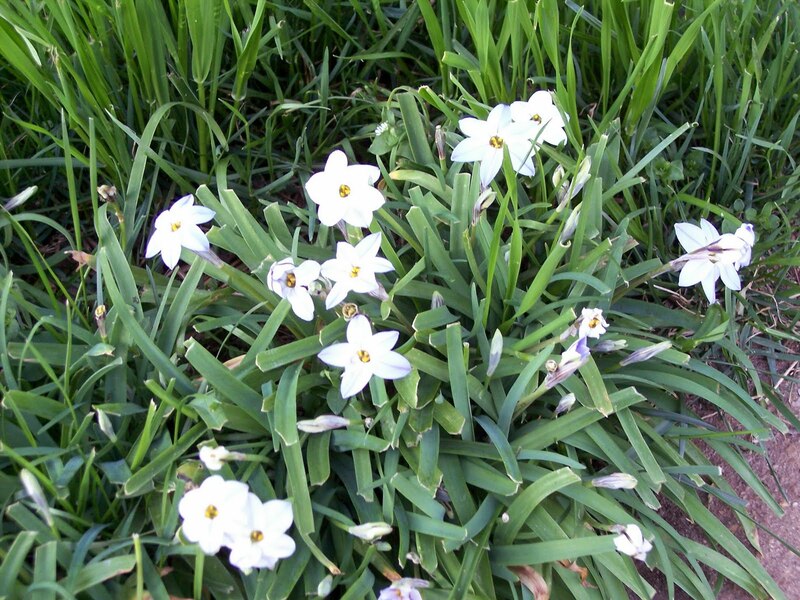 They appear to have resolved the problem and I posted the phlox pix below. Just can't seem to get into the swing of daily posting here. 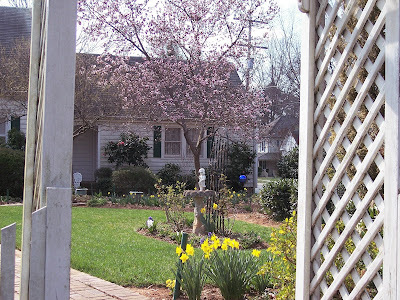 Looking at another busy day but here's a couple more pix of springtime in the little city. Glad to have the reminder of warmer weather, since it's been cold again here. Had to turn the heat back on a few times a day to keep the chill off. Dad calls these phlox but they look like gigantic bluets to me. As you can see in the long shot they're pretty darn big. Pretty though. 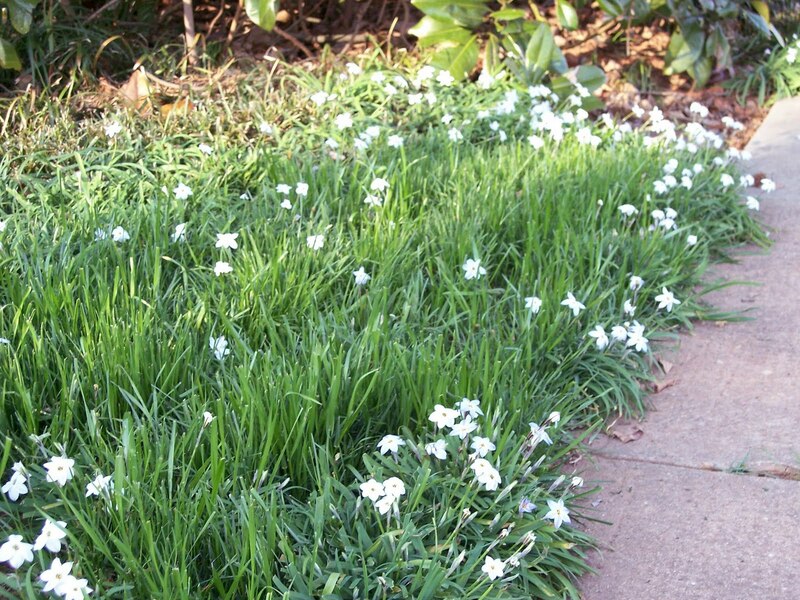 And in other news, a bunch of violets popped up in my lawn overnight. No pix, but that makes me very happy. Oops. Blogger appears to be having a nervous breakdown and isn't posting any pictures. Assume it's a server problem since all the old pix have broken links too. [They fixed it today.] I'll be back later to post the phlox, but to entertain you for the moment, The Owl Box livestream videocam seems to be working fine. All four of the chicks hatched and you can see them sometimes. It's pretty amazing. It's been another busy week. Never seems to be enough hours in the day to get everything done, much less keep to my resolution to walk for half an hour every day. But I still have some pix from last week's big walk. This is one of my favorite yards in town. 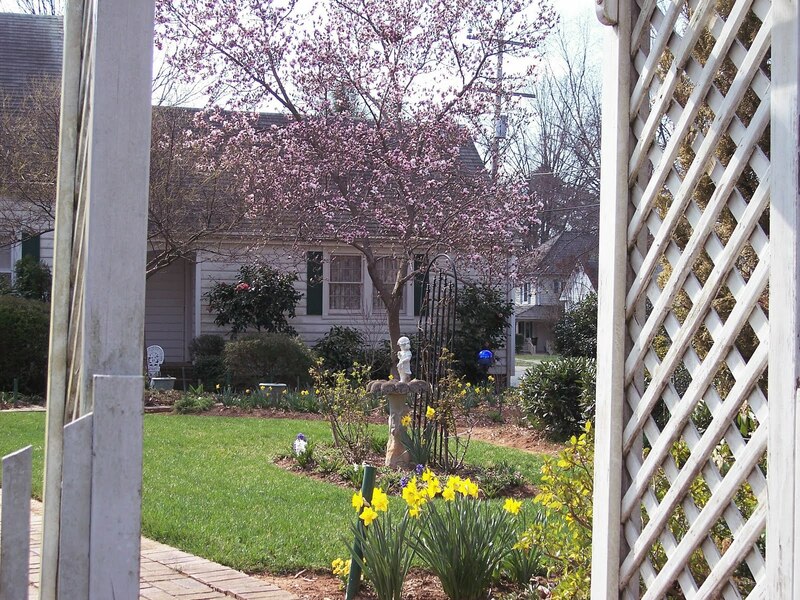 My pictures never do these things justice, but I adore arched gateways like this and the yard is so beautifully kept. It feels like you might be stepping into a fairyland if you walked through it. In other news, I met a young guy in the cemetery a couple of weeks ago. Can't remember if I posted a link to his site here so apologies if this is a repeat. He's a singer songwriter who lives somewhere nearby, Desmond Myers. If you look him up on youtube, there are lots of videos of varying quality, but the sound at his official website is the best. Sadly he confirmed for me that there isn't a music scene here in the little city. He mostly performs in Charlotte. Slightly more encouraging is the local library screens fairly new films a few times a month. This week they're doing Planet 51, Couple Therapy and 2012. I've seen their screening room. It's not quite movie theater size, but it's looks okay. Think I'll try going at least once since I don't have a DVD player of my own. Oddly, the one I want to see most is Planet 51. I expect the place will be overrun with kids but I love animation and the trailer looks good. Had a great family dinner for my Dad's birthday yesterday. My sister took us all out to his favorite restaurant. I swear I'm still in a food coma. Probably won't have to eat again for days. And it's cold outside again. I'm back in the winter jacket but the flowers seem to be holding up okay. A couple more pix from my walk in the warm weather last weekend. 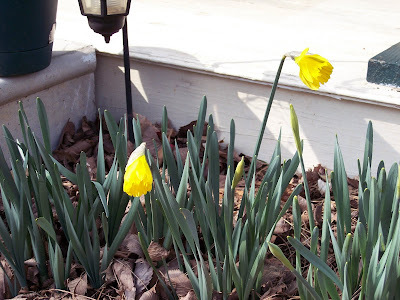 The daffodils all busted out. I love the two color ones the best. 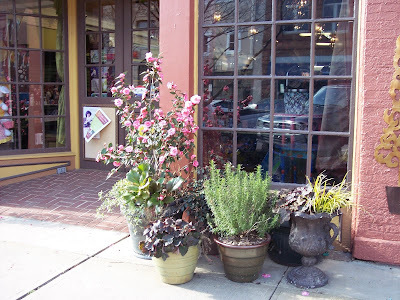 And I love this sidewalk arrangement downtown. Not a very good shot, but the tall pink tree looks like the same winter camelias that are in all the yards around here. Flowers don't last so long when they're potted though. 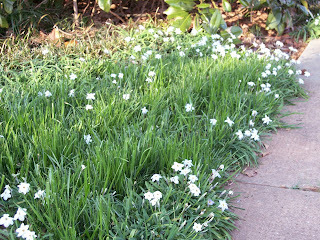 They had all almost fallen off when I walked by a few days later. A lot more flowering trees busting into bloom in the yards as well. We have magnolias already in some of the sunnier spots. No pix of those yet. I'm behind again and it's late so here's a photo from my walk the other day. 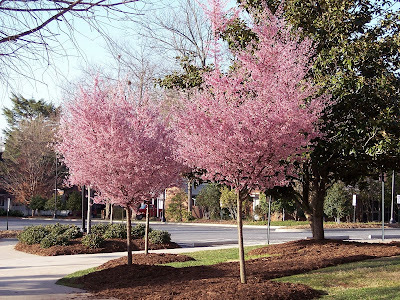 Lots of these pink trees on campus right now. And this is so cool. I don't know what I like better. Watching the streaming live video of momma owl hatching her eggs or watching the the old couple who own the camera pitch their coffee mugs. I've been having a crazy week. I haven't even had time to upload my latest photos from town, but if anybody is still stopping by, here's a great National Geographic photo I picked up somewhere. 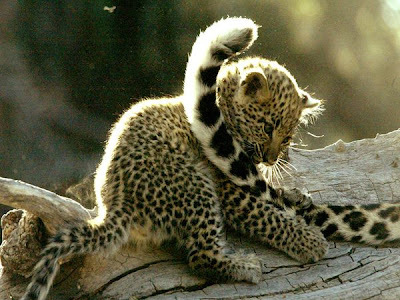 Love this little guy playing with his mama's tail. Sad that Peter Graves died. I loved Mission Impossible with Peter Graves. Loved the whole cast really but Graves, Landau and Bain were my favorites. This is a great compliation of all the opening shots of the show. Have to stop giving a timetable. It never fails when I say on here I'm going to get something done in a specific time frame that something happens to stop me. I really wanted to get the upgrade finished but I got violently ill last night and been punky all day. So you get my last two pictures from earlier in the week instead of the blogroll back. Hoping somebody can tell me what these flowers are. Seem to recall I went through this last year and it took a really long time to figure out. 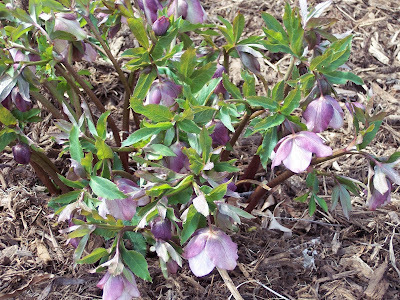 And of course, I forgot what they're called, but this year I have better pictures. I really like the flowers. And here's a wider shot to give a sense of the size and habit. It's a fairly large plant and probably about a foot high. And the branches are dark but not woody. So any guesses on what it's called. It's going to drive me crazy until I remember. Yeah, I know that I haven't managed to finish the upgrade. I'm still ditzing around trying to work up the courage to upgrade to the newest template but I'm afraid it won't have an html option on the dashboard. The sizzygig thing they use in the compose mode is not something I'm good at using. I always end up screwing up the formating. But one way or the other, I'm going to at least restore the blogroll this weekend. It's what I use to visit my favorite blogs and I'm missing you all. 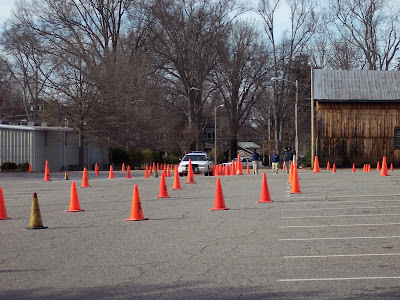 When I was walking through town the other day, I ran across a high speed training session in the college parking lot. The entire lot was filled with orange cones and the two cars where both driving at once in these intricate maneuvers. It had the feel of a teach your kids traffic safety event. I thought it was the local police at first, but it turned out to be the campus cops. Guess they were practicing in case there's a high speed case through their two block long parking lot. Gotta love small towns. Yesterday was so gorgeous I spent the day outside checking out the town. I finally went into the used book/pet store. The book part was pretty dismal but the store is lot bigger than I expected and really well stocked with supplies for any kind of animal and they sell a lot of odd ones. The snake tanks were kind of depressing. The tiny little mice shivering in the corners waiting to be eaten was just sad. Also saw a live scorpion for the first time ever there. Man was that scary looking. Can't imagine why anyone would keep one as a pet. 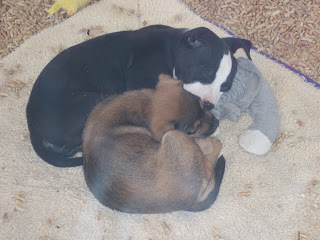 The doggies in the window on the other hand are always cute and cuddly. These two guys are supposed to be a mini-Pit Bull and some kind of Jack Russell mix. I was surprised the picture came out this well since the window is so dirty but viewing from the outside is definitely better. They don't appear to clean out that bedding stuff very often. The inside of the store stinks from it, especially where they keep the used books. Finally, a perfect spring day. 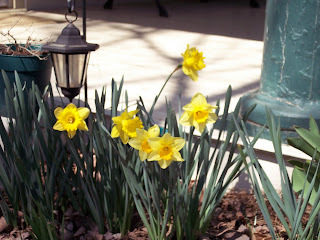 The daffodils at the end of the porch made their move this afternoon. Took this around 3:00 and they're already almost fully open at 5:30. 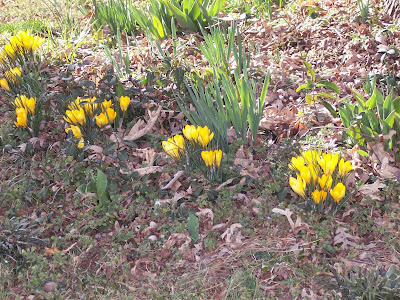 Meanwhile, these crocus across the street have been fully splendid for a couple of days now. Took this one yesterday and today there's a brand new white one mixed in with the yellow. 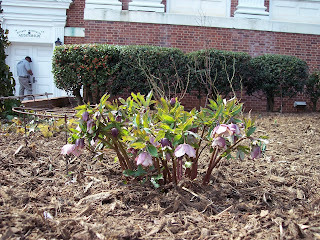 There's also a really cool plant I don't recognize blooming in front of the college. Unfortunately the sun was too far gone to get a good shot of it but I hear it's going to be just as beautiful out tomorrow so I'll try again. I don't really care about the Oscars since I stopped going to movies. Usually I haven't seen the nominees. But I do watch the awards for the dresses. Although those who know me might laugh, since I'm terrible at putting together outfits, I have had a lifelong interest in fashion and like to see what the latest trends are. Anyway, it's going to be a gorgeous afternoon here and I'm planning to take a walk so in case I don't get back, I ran across this gorgeous gallery of photos from the Oscar award ceremony from the 50s. Pretty amazing to see all my old movie heroes when they were young. And this story intrigued me. A Chinese nun finds a flower under her washing machine that they say only blooms every 3000 years. "Local temples believe the mini blooms are specimens of the miraculous Youtan Poluo flower - called 'Udumbara' or 'Udambara' in Sanskrit, meaning 'an auspicious flower from heaven.'" You can see a photo of them at this link. They're not much to look at; kind of reminded me of ghost mushrooms, but still think it's a really cool story. 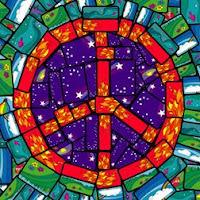 Hoping it's an omen that the world is going to get a little more peaceful. Feels like everything is so crazy lately. This is the coolest perpetual motion thing I've ever seen. The Grim Reaper has been so greedy in the last few years. I've lost yet another friend way too soon. Joe Kennedy was only 49 years old. Of course, I haven't seen him in years and I wouldn't say we were close, but back in the day he was a fixture in my social circle. He was an odd guy. Really big and tall and sort of goofy in a "not the brightest bulb in the lamp" kind of way. I sometimes wondered if he was slightly retarded. But he was very good natured and the joy on his face when he was allowed to sit in on a jam session with some band and play his harmonica just lit up the whole room. He broke my finger once, by accidently slamming it in a car door. He was practically sobbing in the parking lot over it and for months later he could never look me in the eye. I guess he felt guilty even though it was clearly just a silly mistake. I can't say I'm going to miss him so very much since I haven't even thought about him in a very long time, but he was a good soul without a mean bone in his very large body. There's not enough like him anymore. It's a loss to the world. Rest in peace, Joe. I never seem to have enough time to get everything done, so I've been neglecting the blog again. Have a couple of things to share at some point soon, but for now to amuse you here is yet another hummingbird webcam. This one is the mama sitting a new egg. And this is so cool. If you're old enough to remember going to the drive-in regulalry, the intermission videos were always my favorite part. I remember a lot of these in this video of some of the well-known snack bar cartoons and there appear to be more links at the main page. Hope I find some time to look at all them. I haven't seen the one with the hot dog jumping into the bun yet. That was my all time favorite of all.